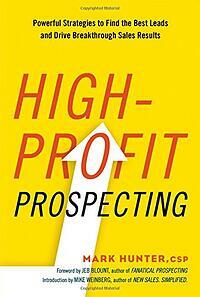 Recently I had a chance to interview Mark Hunter, author of new book High-Profit Prospecting. I’ve known him for years. His stuff is good. If you're looking for ways to be more effective at prospecting and to get better sales leads, listen in on our recent conversation. I promise you’ll learn something! Jill Konrath: Hi there. I'm Jill Konrath and I'm here today with a friend of mine and a colleague, Mark Hunter, the Sales Hunter. The reason we're talking today is because he has a brand new book that came out called, High Profit Prospecting. I have been writing about prospecting for a long time and have a lot of thoughts about it so when Mark came out with his new book, I absolutely wanted to find out what he has to say and what might be of value to you. Mark, thanks for being here today and I'm really glad to talk with you. Mark Hunter: Hey, thanks for allowing me on and by the way, also, thank you for allowing me to put your name on the back cover of the book, and I call you out in the acknowledgement section of the book. Hey, Jill, you've been a terrific supporter of mine. You've been full of a lot of great advice. I very much appreciate it. Jill Konrath: I thought you were just going to say I was full of it and stop there but you did continue on so I'm really glad to see that. Okay, so I have a question for you. How do you define high profit prospecting? Mark Hunter: Well, let's define high profit prospecting by going to what's the solution. You want to be able to close more deals without having to discount. Really what happens is a lot of people wind up having to discount sales in order to close them because what they've been doing is they've been going after Wal-mart shoppers and trying to turn them into Nordstrom customers. If you want to do high profit prospecting, you've got to start with the right prospects to begin with. When you start, with the right prospects, it's amazing how much better, how much more efficiently, how much more effective you can be in closing at full price. Jill Konrath: I'm assuming that you're seeing people going after the wrong prospects often times from the get go, is that correct? Mark Hunter: Yeah, because too many salespeople have this, "Well, if they have a heartbeat, they're a prospect." Let me tell you something, my dog has got a heartbeat. Let me tell you something, my dog is not buying from me at all. We have to be selective. The whole objective I have is to show people how your objective is to spend more time with fewer prospects. Think about that for a moment. More time with fewer prospects. Jill Konrath: That's exactly my philosophy too. I think the emphasis on the past few years has been driving more and more prospects as opposed to looking at the quality of the prospects. It's not just the Wal-mart shopper versus the other one, but even the indicators that are going on in their business or in their greater world that would help them decide to change sooner rather than later. Mark Hunter: Yeah, and you know what? You've been a master of that because early on you were a real champion of that whole voice mail, that whole piece where, if you leave a stupid message it's not going to be returned. If you think about that, what were you trying to convey to people? If you don't bring value to your prospects, why should they even communicate with you? You were really on the cutting edge of that with all of your books, really going back to selling to big companies, which really started this whole trend. Jill Konrath: I think if you put yourself in the prospect's perspective, and you're a busy person and you're going through your emails or you're going through your phone messages, and you're sitting with your finger on the delete button. That is how we all work today. If you can't deliver a message to somebody that doesn't get them to hit delete, if somebody's deleting you, you have no chance and then you just have to call that more often and call back and then you turn into a pest and it doesn't work at all. It's not effective. What are you seeing that is working today? Mark Hunter: Well, first of all, let's cut to the chase regarding social media because everybody says, "Well, if you just do enough stuff on social media." Let me tell you something, you can't eat likes, friends, connects, any of that sort of stuff. Here's a tweet, oh, oh, I'm going to give you a social media tweet, how's that sound? Hashtag social media without social community is social stupidity. Jill Konrath: That sounds like something I could write on m computer right now and send out, right? Mark Hunter: There you go. Let's wait til this is over, okay? Here's the whole deal, social media works great. Social selling works great but you have to take it to a one to one relationship. It's one to one. It's not just throwing a bunch of stuff and throwing it out there. That's like putting a billboard on the side of the road. Great, a lot of people see it but are they really going to take action? Too many times that's what people think social media, social selling is all about. I want to be able to take prospecting and make it one to one. How do I get to that one to one? By making it about them, not about you. That's a real challenge because think about it, it really is helping the customer see options that they didn't think was possible. That's really your goal is sales so you've kind of go upstream and begin that at the prospecting level. You've got to help those prospects see and achieve what they didn't think was possible. That's how they begin to buy into you. That's how you begin to nurture them to become that high profit customer. Jill Konrath: Okay, so I just got an email today from somebody saying that they read my crap selling manifesto on my website. In it I state that there's a whole bunch of crappy words that you should never use like, leading edge, state of the art, you know, all those words that define who you are, like you're the most wonderful service oriented company in the entire world. What do you have to say to that person who says, "If I can't use this what should I be saying?" Mark Hunter: Well, think about this. I don't exactly go up to my wife and say, "Hi. I'm leading edge." No, I mean come on. One of the big challenges is we get caught up in this sales speak, let your personality come through. You want to have a conversation with the prospect, the same way you'd have a conversation with a friend. When you allow, because think about this, authenticity and transparency is more important than ever, especially with millennials. Millennials are very much looking for authenticity and transparency. If you're coming through with, like you said, those leading edge and all those, synergies, give me a break. Mark Hunter: Oh please, choke me right now. This is the whole thing, you've got to create this conversation, and maybe to a certain degree, this is the advantage that social media has taught us, whether it be SnapChat, whether it be Twitter and so forth, it's all just very short, condensed, but it's relational. Jill Konrath: Define what that means. When you say it's relational, tell me what it means and how will somebody know if what they're doing is relational versus deletable sales crap. Mark Hunter: Deletable sales crap, because that's what the majority of this stuff is. First of all, you have to realize that everybody has a footprint on the Internet. My first objective is to go out before I'm prospecting you is I want to find out a little bit about you. Then, I'm going to us that. I may not be able to find about you personally but I'm going to find out about the company you work for and so forth. I'm going to make sure my message begins targeting, very specifically, to your needs. It's not to the point that, whoa, this is creepy stalking, but it is where you say, oh, wait a minute. This person, I think I do want to touch base with them because they do have something of interest to me, something of value to me. You have to be seen as one of them. If you're not seen as one of them, this is especially critical. Jill Konrath: Can you talk more about that? Mark Hunter: If you're prospecting at the senior level, you're talking anybody at the C Suite, anybody with VP, anybody with director in their name, you have got to be seen as one of them. It's just this vendor. Jill Konrath: Okay, I have a question for you. You're sitting there and you have grey hair, right? Mark Hunter: Oh thank you for calling that out. Yes, I do. Jill Konrath: Yes, you do. What if I am twenty-eight years old and I don't have grey hair and I am talking to one of those big wigs, the higher levels, and I really don't have the background or the moxy or the credentials to be able to have a one on one conversation with somebody like you who's a big wig that has grey hair. I'm not qualified and I'm scared of you, by the way, I'm scared of you. Mark Hunter: Well, excuse me but how old was Zuckerberg when he created Facebook? How old was Bill Gates? How old was Elon Musk when he really got going? Don't let age hold you back. It is the knowledge and how you come across. I know a lot of twenty-five and twenty-eight year olds you describe who are incredibly brilliant, incredibly insightful. Jill Konrath: Yeah, I do too. Mark Hunter: It's the ability of having the confidence and the competence to have that discussion with that senior level person. That's what it's all about. It's not being scared. It's not being like, "Oh, wow, you look like my dad." No, please. That really creeps me out. Jill Konrath: When I was a young person, I'd go out on calls and people would say to me, "You remind me so much of my daughter." That was always creepy too. It made me feel like I wasn't seen as a colleague like you're saying that I need to do. You know the truth is we have to speak that language but sometimes we don't always have the depth of knowledge or expertise in our background, so what do you suggest salespeople do to make themselves worthy of talking to? Mark Hunter: All I need is one piece of information that's going to lead to one question, and whatever they share with me, I'm going to in turn ask them a follow up question. I'm going to ask them to continue to expand on it. One of the challenges that people have when they prospect is they feel they have to get into this script, they have to get into this doot, doot, doot, you know. One, two, three, four ... No, no, no. Your objective in prospecting is you have the privilege, honor and respect to be able to meet with that person again. However that is, whether it be on the phone, whether it be by way of email, whether that be in person. All I need to do is I just have to have one piece of information. I can ask you one question and then I ask you a follow up question. The follow up question can be, that's a great point, can you expand a little more on that. Now you notice, I'm not saying that from a script. I'm saying that from a point of, yeah, I'm really interested in knowing. Jill Konrath: You know what, I think what you're saying is really important because when I see people preparing for calls, the one thing that they do is they prepare what they're going to say and I'm going to say this and I'm going to say that, when I get you on the phone, but there's one thing that they often forget, and I think they have to plan it ahead of time and that is, what question am I going to ask. Mark Hunter: It's just the start off question. All I have to have is one question. Then, you let whatever they say share with you, the next piece, the next piece. Jill Konrath: Right. People don't plan that question and yet that question is so crucial. If you're talking to somebody and you say some of the top three trends in your industry are A, B and C, which of these is the most important, is a great question to ask because it tells you where they're going. For example, if I was calling and talking with them about a sales training program, I might ask about what have they found to be the biggest challenges that they're dealing with now, the biggest sales challenges that people are facing. The question has to be, of those three that you mentioned, which takes priority right now. It's a question that opens the door to the conversation. Mark Hunter: Right. All I have to do is get the door open and then I can keep dialoguing and keep dialoguing. I'm going to earn the right to the privilege, honor and respect to meet with that person again. Mark Hunter: Prospecting is not the mysterious, freaky thing, no. It really is a fun process when you handle it correctly. Jill Konrath: Okay, Mark. That needs explanation because I don't think most people who are listening would say, "Oh my God, this is so fun. I can't wait to get off the interview so I can bang out ten calls right now." I don't think we're hearing that. Mark Hunter: You're probably right. They're probably saying I'm smoking dope and jumping rope by saying that, but here's the whole thing. There's a lot of things in life that you may not say I really enjoy doing, but you know you've got to do it. Here's the whole thing, I'm not going to be gun shy about prospecting for one very simple reason. Because A, I want to eat. That's a very basic piece but here's the whole thing. If you believe that what you have can help somebody achieve an outcome that they did not think was possible, doesn't that get you excited? Doesn't that feel good? You, for instance, you've delivered a lot of training programs, a lot of development programs. That jazzes you when you see a company that you're working with being able to achieve results that they weren't able to achieve before. It doesn't matter what we sell, it could be a product, it could be a service. When you look to the outcome, what you are doing is selling the outcome, the result, the benefit. You're dealing with people. When you look at it from that regard, I think it takes on a different perspective. Jill Konrath: I agree with you that when you honestly understand that what you do matters, it does take on a different perspective. I would like to go back to this fun part, and go to quote a resource that I have always felt was deeply profound. That would be Mary Poppins. She said, "In every job that must be done there is an element of fun, and when you find the fun then snap, the job's a game." The truth of the matter is, if we can find fun in our prospecting, it makes a difference and then we can find the fun in it by creating challenges. For example, deciding that we want to see how if we get somebody on the line, how we can actually engage them and have a really good conversation, that does make you feel good, it really does. Mark Hunter: It does make you feel good and it was really good who you put snap selling into the dialogue of this interview so that's excellent, I love it. Jill Konrath: Yeah, we've got to snap to it, okay. I'm going to give you the final word. Mark Hunter: The final word is this, if you really want to be able to close more sales without discounting, come back and question yourself, what is the prospecting process that you're using. The key to prospecting is having the plan and following through. The number one problem people have when it comes to prospecting is they simply do not follow through. Follow through and you will achieve results. As our good friend, Jeb Blount says, what you prospect today is what you'll close next month and it is amazing. If you want to be closing more deals next month, you better start prospecting this month. That's why I wrote the book, High-Profit Prospecting. Jill Konrath: Yep, so let me just say to everybody if you're listening in, this book is now just available so you can get your copy. I think it's on Amazon and everywhere and probably at bookstores right now too. I want to thank Mark Hunter for being here today and sharing his wisdom on high profit prospecting with us. Thanks Mark. Mark Hunter: Thanks so much. Really enjoyed our conversation.